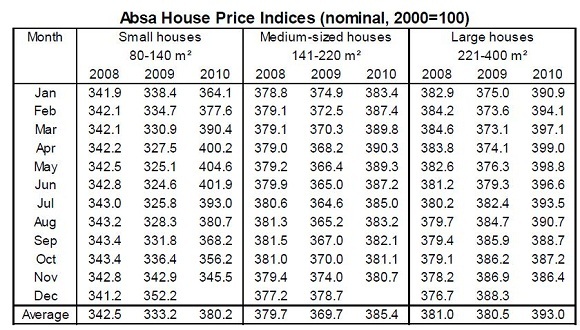 Year-on-year growth in the value of middle-segment homes for which Absa approved mortgage finance (see explanatory notes) slowed down further in November 2010. 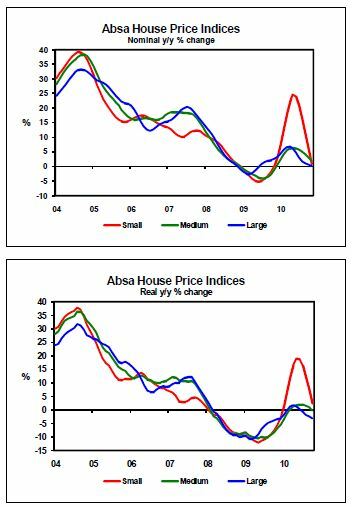 In all three categories of housing measured by the Absa house price indices (small, medium sized and large houses), price growth was lower in both nominal and real terms in the penultimate month of the year compared with a year ago. On a monthly basis, home values continued to decline after reaching a peak around April this year, but the pace of monthly contractions appears to be slowing down. Although the base effect of a recovery in house price growth in the second half of 2009 is impacting year-on-year price growth calculations in the second half of 2010, the downward trend in price levels over the past few months is believed to be related to economic developments in general. These include slowing economic growth since the second quarter; job losses totalling 275 000 in the first three quarters of the year; a markedly slower pace of interest rate cuts than in 2009; no improvement in consumer confidence during the course of the year; and consumers still having high levels of debt in relation to disposable income. Although interest rates are low and growth in real household disposable income and consumption improved in 2010, credit extension to the household sector, including mortgage advances, continued to record single-digit growth up to October this year. The average nominal value of medium-sized houses (141m²-220m²) increased by 1,8% y/y in November this year (3% y/y in October), which brought the price in this category of housing to around R951 100 in November. In real terms prices dropped by 0,4% y/y in October after rising by 0,9% y/y in September. In the category of large houses (221m²-400m²) the average nominal price level was marginally down by 0,1% y/y in November after increasing by 0,3% y/y in October. The average price of a large house came to around R1 407 300 million in nominal terms in November. A real price drop of 3% y/y was recorded in the large category in October, after declining by 2,4% y/y in September this year. On the back of the value of middle-segment homes having been noticeably higher in the first half of the year compared with the same period last year, while year-on-year price growth started to slow down from around mid-2010, average nominal house price growth of about 7% is expected for the full year. Real price growth for this year is forecast at around 2,5% y/y, taking into account the headline consumer price inflation rate expected to average 4,3% y/y in 2010. Nominal house price growth of just below 5% is projected for 2011 on the back of the outlook for the domestic economy and the consumer sector. Based on expected nominal price trends and the projection for consumer price inflation in 2011, the average level of house prices is forecast to remain virtually stable in real terms next year compared with 2010.